The reticulocyte count test checks the reticulocyte count blood level. What is the reticulocyte count test? The reticulocyte count blood test, sometimes known as a retic count test, measures the reticulocyte count blood level. Why is the reticulocyte count blood test important? The reticulocyte count test helps screen for conditions leading to red blood cell destruction. This Reticulocyte Count Test is a blood test. The reticulocyte count test, sometimes known as a reticulocyte count blood test, reticulocyte blood test, and retic count lab test, measures the reticulocyte blood count. Reticulocytes are immature blood cells that are an important part of the red blood cell (RBC) creation process. Made in the bone marrow, they turn into mature RBCs approximately 24 hours after being released into the bloodstream. While typically accounting for a small percentage of the overall blood cells, reticulocyte counts can become elevated in certain settings. If someone has anemia, for example, the body tries to compensate for the inadequate amount of RBCs / hemoglobin by quickly releasing more RBCs, even if they are immature. This reticulocyte count blood test measures the percentage of reticulocytes in the blood. This retic count test is typically elevated in conditions in which red blood cells are being destroyed too early. To get a reticulocyte count test near you, order online and get your blood drawn at the Quest Diagnostics lab that you selected. Once your retic count lab results are ready, they will be available for download. 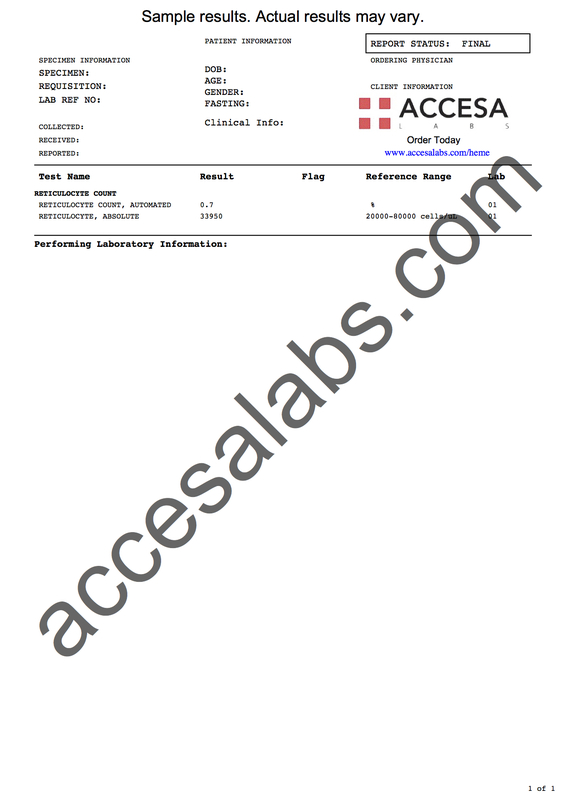 As can be seen on the sample reticulocyte count test lab report above, the reticulocyte count and absolute reticulocyte levels will be reported as numbers that can be compared against reference ranges provided by the lab. The reticulocyte count test is sometimes ordered with the CBC test for a better understanding of the red blood cells. The reticulocyte count blood test is part of the anemia test panel. In the laboratory, reticulocytes are counted using specialized detectors that use lasers to identify reticulocytes. When evaluating the retic blood count in consideration of a possible anemia, most clinicians will use the reticulocyte production index (RPI) for a better understanding of the underlying picture. Reticulocyte Count Test at Guaranteed Prices.